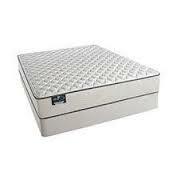 The Carter Firm Mattress by Simmons BeautyRest, is a quality, firm-feeling mattress offered at an affordable price. By using innerspring technology combined with a density firmer wrapped coil support system; this mattress provides a firm comfort level and quality support.The Carter Firm is most suitable for people of prefer to sleep on their stomach or on their back. This product is available in twin, twinXL, full/standard, queen and king sizes. This mattress comes with a 10 year full warranty.